6mm BR Norma Gun of the Week -- Select 6BR Rifle for benchrest, precision and Varmint 6mm Shooters. 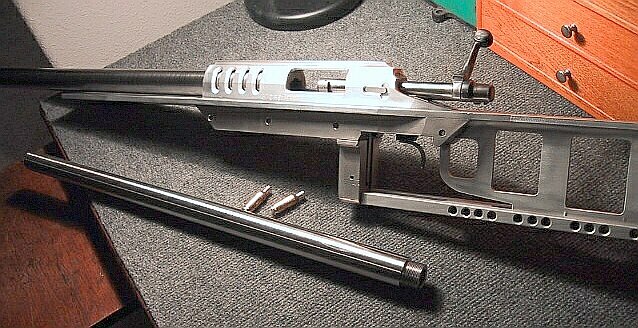 With reloading info and free photos. Mike's Marvelous Mystery Gun first appeared in the Reader's Photo Gallery, and it produced lots of interest. 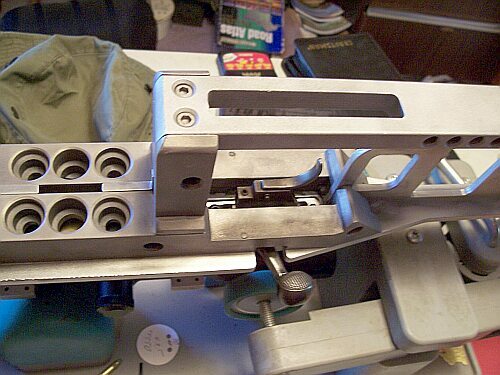 Well we've got some more photos and Mike Murphy has been kind enough to give us a report on his unique 6BR switch-barrel rig with its one-of-a-kind all-metal stock. Mike reports. "Here's my metal-framed 6BR with a 22BR switch-barrel laying beside it. Both barrels are Harts and they shoot great. The action is a stainless Remington 40x that was trued, and mounted in a custom sleeve that bolts directly to the stock, or what I call the frame. It has a standard 6mm BR Norma chamber with a .265" neck. I shoot 68gr custom-made bullets in Lapua brass. It has turned out to be one of my best-handling benchrest guns. I'm still working up a good load, but that is not far away. "This 6BR is the best tracking Benchrest rig I have ever set on bags." This is a old 40X action with some small mods made to it. It is now a switch-barrel rig with a extra Hart 22BR barrel. The Hart 6BR barrel is a 1:14 twist, 24" full-contour (1.250" OD straight, no taper). I can't claim credit for the innovative metal stock. It was made by a smith in the northwest who shall remain anonymous for now. He only makes a few now and then, and only if he is begged and you hand him your check-book. I've been asked not to disclose his name here because he is a master machinist for a major U.S. Government high-tech facility. Needless to say, he is familiar with building very sophisticated metal components and prototypes that go into zillion-dollar scientific assemblies. His frame design I guess you could say is trickle-down from Uncle Sam's research programs. He has access to tools that the average smith would never have. The amount of precision fitting that went into the frame is amazing. Many of you looking at this stock for the first time might be skeptical. Yes, it IS pretty radical. But I can tell you--this 6BR is the best tracking Benchrest rig I have ever set on bags. If you notice holes cut in the frame they are for adding weight with some attachments I have. So if you are moving to a heavier load you may want to move some weight towards the nose or to the rear as you see fit. There are also some other cut-outs made to assist frame component assembly.